1. Call or use our Secure Online Form to arrange a free initial consultation & Care Assessment with no obligation. 2. One of our Care Managers will arrange a convenient time to meet with you in the comfort of your own home to discuss and review the most appropriate, individualized home care services that you may need as well as any special requests. 3. We will use the information you provide to find the best match for your loved one with our Caregiver Compatibility Guarantee. 4. 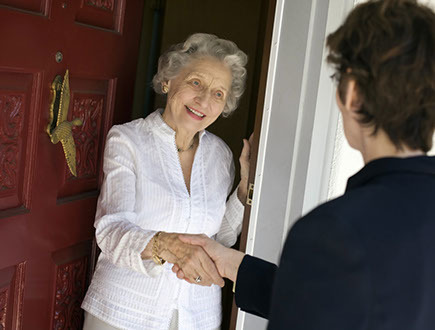 One of our Care Managers will accompany your assigned caregiver on the first visit to your home to both make introductions and ensure any of your special care requests are communicated. 5. We will routinely follow up with you via telephone calls and in-home visits to ensure your continued satisfaction and address any adjustments to the course of care that may be needed.